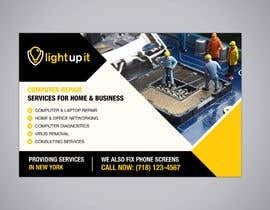 I'm looking for HALF of letter size format hand flyer design. I'm going to give out the flyers on the street. 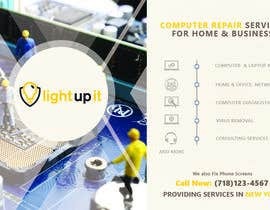 For now use the company name" LIGHTUPIT and phone number: (718)123-4567. 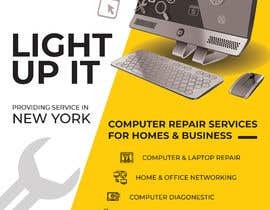 The flyer has to have computer repair services listed for homes and business located in New York. Include that we also fix phone screens. Use the logo attached. Please check my entry #99 & #115 hopefully you will like it...thanks. Please check my entry #99 hopefully you will like it...thanks. Please check #30 ... Thanks! 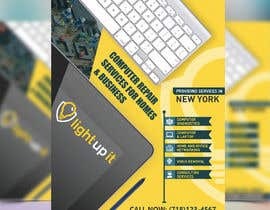 is company name "LIGHTUPIT" or can be written as "LIGHT UP IT"? Kindly check the entries. Text will be finalized as per your instructions later. Thanks. Inbox to discuss more if possible.